"Great alternative to a greasy pizza!" Bring a large pot of lightly salted water to a boil. Cook rigatoni in the boiling water, stirring occasionally, until tender yet firm to the bite, about 13 minutes. Drain and let cool, about 10 minutes. 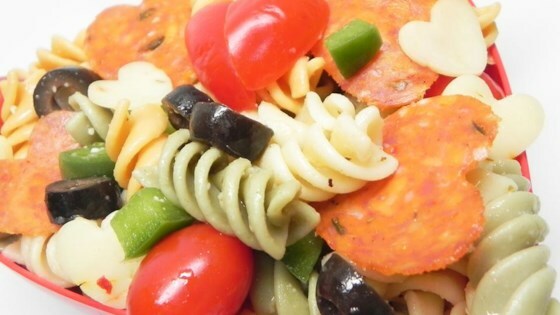 Combine pasta, onions, tomatoes, provolone cheese, green bell peppers, pepperoni, and olives in a large bowl. Whisk olive oil, vinegar, Parmesan cheese, sugar, and oregano together in a bowl to make dressing. Pour over pasta mixture; toss until well mixed. Substitute mozzarella cheese for the provolone cheese if preferred. loved it. I used cherry tomatoes and halved them. Used one onion and one bell pepper. this is my go to recipe from now on.